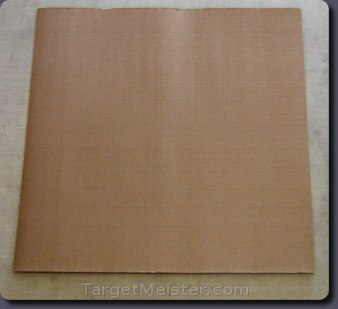 Cardboard target backing used to support a single large or multiple smaller paper targets. The backing measures 30 inches square but rolls up into a 4-inch diameter. Because this backing can be rolled up, it is more convenient to transport and space-saving compared to flat backers of equivalent size. Although it is flexible and rolls up to one-sixth its length, it is rigid once it is properly attached to the target frame. Attaching paper targets directly to this backing instead of the target frame will help prevent your targets from ripping in the wind. This backing is sold in packs of six. Try them out with your paper targets. If you don't think they are more convenient than regular flat backers, we will refund you 100 percent or replace them with an alternative backer of your choosing.